Find out what you should ask a potential software vendor to make sure they’re right for you. Choosing a good strategy management software is important, but choosing theright vendor behind the software is critical as well. That’s why you need to learn the facts about them. Will you get unlimited access to their support team? Do they have customers in your industry? Will you like working with their people? If you don’t like the company you’re working with, it’ll be hard to like the software itself. This handbook will give you the right questions to ask to help you cover your bases and know if they’re the right fit for you. 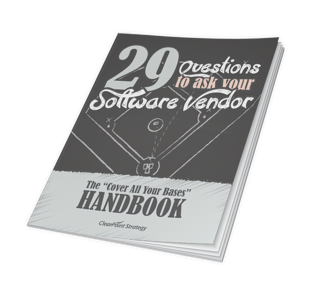 Download this handbook to discover what you should ask a potential software vendor before you make a decision.